Berry tree (Vaccinium spp. ): growing, planting, caring. Blueberries, cranberries - happiness berries! Scientific name : Vaccinium spp. Vaccinium is a common and widespread genus of shrubs in the heath family (Ericaceae). The plant structure varies between species: some trail along the ground, some are dwarf shrubs, and some are larger shrubs growing up to 1 to 2 m (3 to 7 ft) tall. The fruits of many species include the cranberry, the blueberry, the bilberry and huckleberry. Like many other ericaceous plants, they are generally restricted to acidic soils. Vaccinium myrtillus is the common blueberry, but the name can also refer to Vaccinium uliginosum, the bilberry and several American species some of which are cultivated: Vaccinium caespitosum, Vaccinium corymbosum, Vaccinium angustifolium, Vaccinium deliciosum for the most known! In the botanical sense, blueberries belong to the group of cranberries, a term used for all the species of the genus Vaccinium. You can plant from October to March for suckers in bare roots, and until May for seedlings in containers, but avoid doing it during frost periods. Warning ! Plant more than one plant to ensure pollination and fruiting, at least two, even of different varieties! The blueberry likes a sunny exposure but supports the semi-shade, especially if it is leaning against a wall that will shelter it and keep it warm. Also, this one will prefer a slightly acid soil. Remember to weed well before planting, to avoid any risk of competition, especially with weeds and limit invasions and diseases. In a furrow 8 to 10 cm deep, ideally in a north-south oriented line, space each plant 1.5 meters, and also count 1.5 meters between the furrows. Enrich the topsoil with some compost when planting. Warning: do not bury the collar of the plant, it would slow down its growth. Stake your blueberries before they grow too much, to contain their growth, which can be quite fast, but also to ensure optimal fruit production. If you have a whole row of blueberries - lucky! - plant light stakes in line to stretch the wires, at 40 and then at 80 cm height on both sides of your plants, spread about 60 cm. The blueberries will grow and stay contained between these threads - and it's pretty and neat! Watch the stalks well and do not hesitate to bring a rebel strand! If you only have one plant or two, you can use stakes to hold the stems, but you will have to monitor them regularly or change them during the season! Eat the fruits directly on the tree - hard to resist! The whole question is whether if you should eat this berry, which would still deserve 3 or 4 hours of sunshine right now, or if someone will have eaten it before you come back to the garden! Back to business: the fruits must be very blue, full of juice, firm and supple under the pressure of the fingers. When we say blue, it's blue! Pick preferably in the morning. Mulch in April to maintain humidity. Water thoroughly and cover with a thick layer of mulch. You can use dried grass clippings, wood chips, bark, straw or dead leaves. Pine needles or pine chips will be appreciated ! 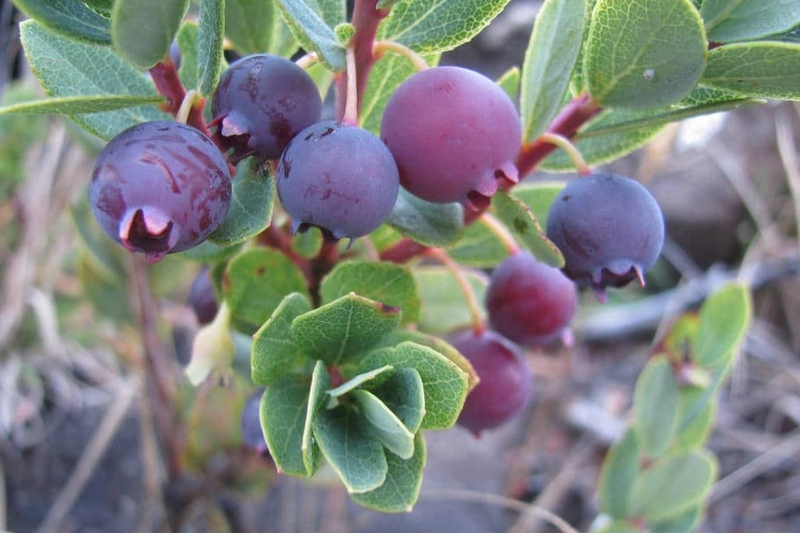 Unlike other berry producing plants, bluberry bushes require quite a bit of water, especially during the first weeks after planting, and during the fruiting period. This need is even greater is they are kept in pots or experience periods of drought. Keep a moist substrate, but most importantly cover the roots with mulch. Depending on the quality of mulch, you may only need to add more on rare occasions. Prune your blueberries towards the end of winter, around in February. The weather should be rather mild and dry, without risk of frost. Prune for "cleaning": cut some of the inside branches to aerate, and then remove the ones that crosses each others or are dead. Know that a branch does not produce more than 3 or 4 years in a row: you can cut them when they no longer produce. For low varieties, you can proceed to a tuft division in the spring. Dig up the stump, and divide the old shrubs keeping only the healthiest splinters. Transfer these chips to a light, enriched, non-calcareous soil - and water copiously for a few weeks. For so-called "tall" varieties, perform a multiplication by layering. The blueberry is fairly resistant to diseases! You can however be confronted with powdery mildew - white foliage on all or part of the plant and especially on the leaves - with rust - orange-brown pustules under the leaves - with the aphids - the leaves curl and lose their color of origin - and slugs, for low varieties. Against powdery mildew, you can curatively treat with a decoction of nettle manure: there are even today nettle manure in shops - 100% organic! Aphids feed mainly on leaves, especially in the spring. To fight against aphids, adopt some ladybugs! There are many ways to get rid of it, however, avoid the method of spraying a solution of soaped water on fruit trees. For slugs, a good solution is to mulch with pine spines, which will scare the little wenches, and acidify the soil!